Email Verifier is a unique program that checks email addresses for the validity. 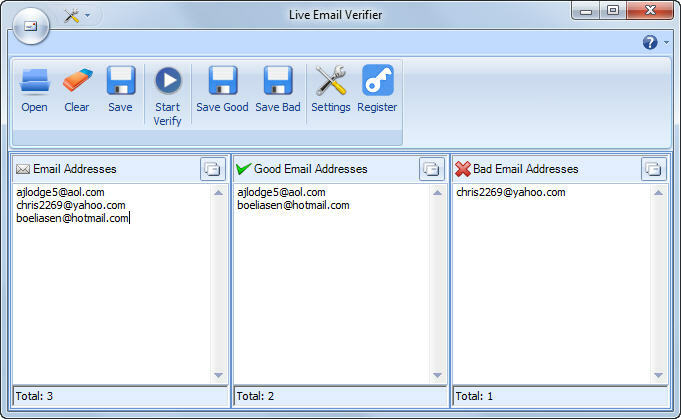 Email Verifier is designed for users who have their own mailing lists and want to keep them up-to-date. Email Verifier will check every email address from mailing list and determine if the emails are still valid. Email Verifier is easy to use, but powerful and reliable utility to verify and clean up your mailing list. Email Verifier decrease Internet traffic keeping you from sending undeliverable messages that causes useless messages between SMTP servers. Email Verifier verifies every e-mail address, allowing you to determine up to 90% of "dead" mail addresses. Email Verifier works on the same algorithm as ISP mail systems do. Addresses for email are extracted from a Domain Naming Server (DNS). Email Verifier tries to connect with SMTP-servers and simulates the sending of a message. For correct work of the program you need to have access to the port 25. If you're operating within a restrictive firewall then you have to use an external socks proxy server. The speed depends on the size of your list, your connection to the Internet, and the speed of the Web.